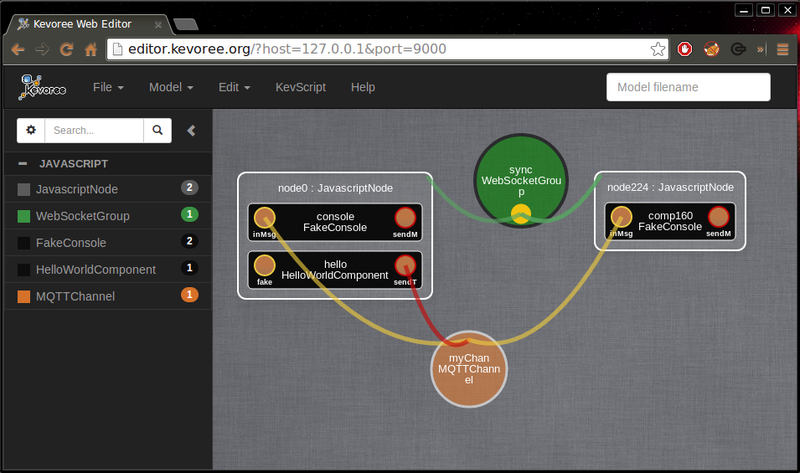 In order to reconfigure a Kevoree model and trigger adaptations of your system after re-deployment you need a Kevoree Editor (Java Editor or Web Editor) and some knowledge of the Kevoree Script (KevScript) language. This will automatically pull the model using WebSocket and the host:port you specified in the URL parameters. Now you should have your model displayed in the editor. If you open the KevScript editor (using the button in the top panel) the content is updated to reflect your current model content. You can edit this KevScript directly and then press Run so that it modifies your model. To deploy your model you just have to click on the node you want to deploy the model to. You now have its properties displayed in a pop-up window (instance name, dictionary attributes, network settings). Because you pulled your model directly from your node in the first you don&apos;t have to specify the network settings to push a model to it. You can just simply press the Push button, and your reconfigured model will be send to your Kevoree platform and it will make the necessary adaptations.